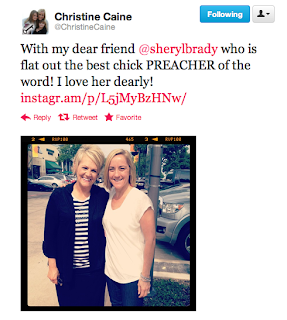 We first were introduced to Christine Caine on this site in “Code Orange” Speaker Christine Caine, and since that time she quickly has become a darling among professing evangelicals, especially the seeker-driven segment. Havingwon the praises of men like SBC megachurch pastor Jack Graham and popular SBC Bible teacher Beth Moore, Christine Caine is rapidly gaining influence. Pastor and author Max Lucado has likened her to Esther, Paul and Mary, and Steven Furtick went so far as to allow Caine to preach the Sunday morning service at Elevation Church this past January. With this burgeoning popularity, then, it ought to behoove us to learn some of the sources of Christine Caine’s inspiration. What pastors influence her? 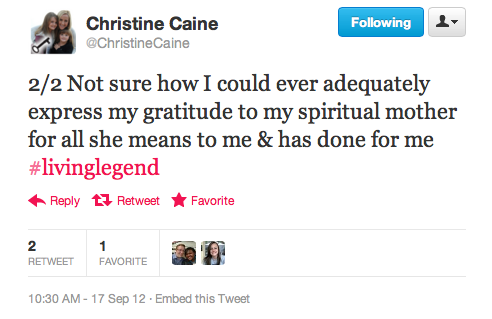 Further influencing Christine Caine, however, is well-known Word Faith teacher Joyce Meyer. 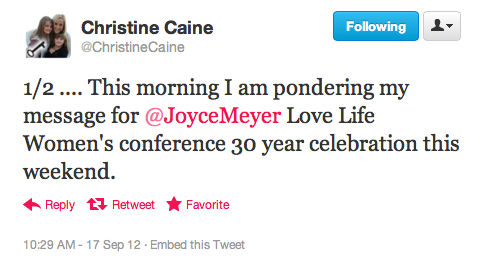 Caine already has told us that she loves Joyce Meyer, but today we learned just how deep that affection may run. Caine is speaking here about preparing a message for the upcoming Love Life women’s conference held each year by Joyce Meyer Ministries. This year’s conference features Christine Caine and Joel Osteen as speakers, among others. 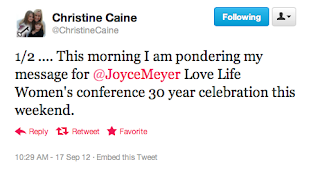 If Caine considers Joyce Meyer to be her “spiritual mother,” then, just what type of spiritual nourishment is being provided by Meyer? While she may be slightly more subtle in her approach to Word Faith teachings than others, there is little doubt that Joyce Meyer nevertheless is guilty of propagating some of these heresies. Why is any of this significant? As was stated out the outset, Christine Caine has rapidly gained influence with some of evangelicalism’s most popular and influential leaders. Yet, if she herself is being influenced by someone like Joyce Meyer, to the point that she would deem Meyer to be her “spiritual mother,” then this ought to cause raised eyebrows and growing concern. It has been demonstrated that Caine herself mishandles Scripture, so when we add to this fact a glowing endorsement of Joyce Meyer, we ought to be nearly blinded by the mass of red flags raised.